With advancements in its technology, Synergy Vision is ready to set new benchmarks in the ophthalmic world. What seemed a thing of the future has now been made possible by Synergy. With AERO HA Matrix lens (Hyaluronic Acid Embedded Contact Lens): The Future Has Arrived! The world is a beautiful place, especially when seen with the best vision possible. Being able to see well can play an important part of leading a productive, fulfilling and rewarding life. Synergy Vision, are committed to provide affordable, efficacious, quality ophthalmic solutions to the people they serve. Synergy Vision was envisaged with this focus of ‘clear vision for all’, by providing the best eye care solutions. Being a subsidiary of Synergy Pharma, a well-established pharmaceutical company with ubiquitous presence in the MENA region, Synergy Vision had forayed into the colour & prescription contact lenses, eye care solutions & diagnostic ophthalmic products to serve the people of the GCC and MENA region. 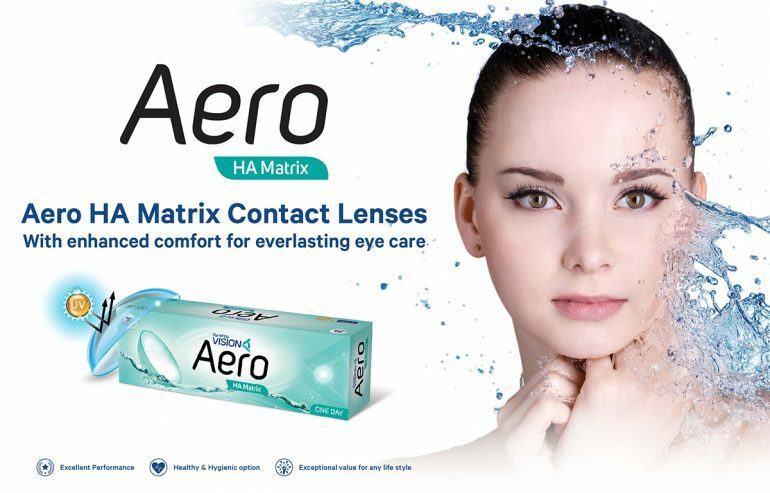 After the successful launch of AERO prescription lenses, the mystical coloured contact lenses OROS & SOLITAIRE, is introducing to UAE for the first time their flagship product ‘AERO HA Matrix’ prescription lenses. AERO HA Matrix, has Hyaluronic acid embedded in the lens surface which mimics the eye tears providing ultra-smooth comfort on the eye for the entire duration of wear. With a unique ‘edge design’ for thin edges, UV blocking feature and wide range of parameters, AERO HA Matrix is well set to revolutionize the ophthalmic world. Truly, with HA-Matrix Technology, wearing contact lenses has never been this easy and comfortable. The Future has indeed arrived!